three NBA championships (National Basketball Association) with the Boston Celtics, and an Olympic gold medal won with the Dream Team at the Barcelona Olympics. 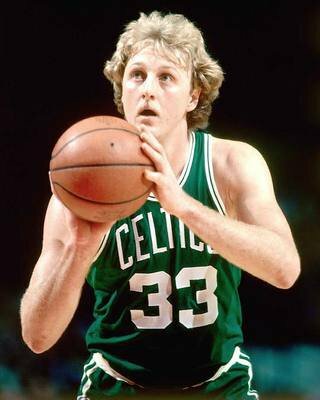 Larry Bird has distinguished three times the title of best player in the NBA league. and grew up in French Lick, a small town of about 2000 inhabitants in the south of the State, which earned him the nickname "the Hick from French Lick" in his professional basketball career. Gold Hand was the thread of Georgia and Claude Joseph "Joe" Bird. he then fight two games, for a total of 8 points7. The following season he played 22 games and his average now stands at 16 points per game. In his final season, he scored 764 points, averaging 30.6, 516 rebounds and 107 assists. With his school, he enrolled in 1 total 125 points for an average of 22.9, 741 rebounds captures and delivers 248 assists in 49 games. His high school performance allows it to receive an offer to join the Indiana University During his final university season, in 1978-1979, Bird led his team to victory at the tournament of the Missouri Valley Conference, then to a participation in the final tournament. This final, with an audience of 24.1 on the scale of Nielsen, is the basketball event had the largest audience in the United States, with about a quarter of Americans gathered in front of their television . Larry Bird statistics on his last season are 973 points, 28.6 average, 505 rebounds, 14.9 per game and 187 assists. Of all of his academic career, he played 94 games, registered 2850 points captured 1,247 rebounds and 434 assists issued. It is the best scorer of his school, has the best average with 30.3, the highest total rebounds and the best average with 13.3. Larry Bird was selected sixth draft pick in 1978 by the Boston Celtics. Upon his arrival in the franchise of Boston, the impact is immediate Larry Bird. It allows the Celtics, who remain on a record of 29 games won to 53 lost games to achieve the best record in the league. Indeed, Boston obtained 61 victories in the regular season and only conceded 21 losses, which then constitutes the third best record in franchise history behind the 68-14 of the 1972-1973 season and 62-18 in the 1964-1965 season. In his first season, he received his first individual awards. It is named best player of February. He won the title of NBA Rookie of the Year Award and was elected in the best five beginners (NBA All-Rookie Team). It is also part of the first five NBA (All-NBA First Team), the other four players are Kareem Abdul-Jabbar, Julius Erving, George Gervin and Paul Westphal. Earlier in the season , he was selected in the team of the Eastern Conference for the All-Star Game , which takes place February 3, 1980 in Maryland. His opponent in the NCAA finals the previous year, Magic Johnson, is also present in the Western Conference team. Selecting the Eastern Conference wins 144-136 after overtime . The NBA playoffs 1981 season marked the return of the Celtics atop the NBA. Larry Bird is a key player of the workforce. The contribution of both domestic players allows variation between inside game and outside it enjoys. Following their first place in the regular season , the Boston Celtics are exempt from the first round and await their opponent. . The Celtics dominate the Bulls by four wins to nil. In the fourth game , Bird is decisive in scoring five points in less than 40 seconds. the Celtics are led by six points to 1 minute 51 after the meeting . They come back and win the game 111-109 . During the first game of this series, Bird realizes that Red Auerbach describe as "the most beautiful work that [ he has ever seen ." At the end of his career, the owners of the proposed Pacers coach Bird. It thus has the opportunity to lead an NBA club. This club has the advantage of being close to the town of French Lick and can allow his mother Georgia, who fear of flying, to come watch his matches. Nine victories in the next ten games, the Pacers get the best record in their history in the NBA with 58 wins and 24 losses. With its results, Larry Bird was named Coach of the Year, NBA Coach of the Year Award. He became the first and only coach at the end of the 2010-2011 season, to get this title after winning the MVP as a player. It is also the second player to accumulate titles coach of the year and rookie of the year (rookie of the year). In his second season at the helm of the Pacers in 1998-1999, he led his team to second consecutive title of the Central Division with a record of 33 wins, 17 losses. For the third season of Larry Bird, the Pacers finished again leading the Central Division and the best record in the Eastern Conference with 56 wins and 26 losses. In the privacy of Larry Bird, shortly after the death of his father in February 1975 and his grandfather Claude September 24, 1975, Larry wife divorced 1975.Ils November 2, less than a year after October 31, 1976 . But during the reconciliation (which will not happen) was born August 14, 1977, their daughter, named Corrie, who Bird has little contact afterwards. Larry Bird remarried October 31, 1989 with a longtime friend, Dinah Mattingly, in Terre Haute, Indiana (both wore faded jeans for a ceremony that lasted five minutes). They adopted two children, Connor and Mariah. Larry Bird has received many awards during his academic career he received his first individual awards by being named honorable mention All-American by the Associated Press in his first season. During his senior year, he accumulates awards: he received the Oscar Robertson Trophy, the Naismith College Player of the Year trophy and the Wooden and Adolph Rupp Trophy. It is designated All-American in 1978 and 1979 by the Amateur Athletic Foundation of Los Angeles. It is one of nine college players to have played in the NBA. He holds the most titles which can apply a league player. It is thus elected three times NBA Most Valuable Player Award - in 1984, 1985 and 1986 also becoming the third player after Bill Russell and Wilt Chamberlain to get this title consecutively, he also gets twice the title of best player NBA finals. He also won the rookie of the Year, NBA Rookie of the Year Award in 1980. He selected twelve times for the NBA All-Star Game from 1980 to 1988 and from 1990 to 1992 ADDITION obtaining the title of best player of the 1982 edition. From a statistical point of view, it was during his career one of the most used by its various coaches players: it is at the forefront of this statistic in 1985, with 39 minutes 5 seconds in 1987 and with 40 minutes 6 seconds . From 1981 to 1990, he always finishes in the Top 5 of the most used players. It is often the first offensive option for his team and finished in the Top 10 ranking of the best average per season six times, finishing second and third in 1984-1985 in 1987-1988. These rankings are due to an excellent success rate at three points, finishing in the top 10 in the league seven times, including a second place in 1984-1985 and a third in 1979-1980. The three-point shot is a weapon that uses a lot: he is the player who passed the most 3-point shots with 82 in 1986 where he is also the player who attempted the most with 194 and in 1987 90 . It also has an excellent success rate with free throws finishing first four times in the league in 1984, 1986, 1987 and 1990 and again in tenth career after the 2010-2011 season. Having played his entire career with the Celtics, it is thus among the best players of the franchise in many statistical categories he is third in total points with 21,791. Larry Bird also received other distinctions or trophies that are awarded by the NBA. It is so designated Sportsman of the Year by the Associated Press in 1986, becoming the first player of basketball to win this trophée.En 1996, in the fiftieth anniversary of the American League, NBA means among fifty greatest players in NBA history. Larry Bird is considered the best white player in league history and a symbol of pride of the Celtics. Despite very average physical qualities, his positional sense makes him a great rebounder. His excellent vision of the game allows him to be a prolific passer. Address and ball in hand skill make him one of the best shooters in NBA history as evidenced by his victories in the competition to three points at the All-Star Game, his first places to throw percentage and average general shooting. Also good interceptor, it is a complete player. It's hard to drive: it does not leave the room until you have completed a series of free throws without the ball touching the circle.